Yellow/orange legs indicate the rare leucistic color phase. Leucistic Trumpeter Swans are born white, do not go through the gray juvenile plumage phase, and often have very bright yellow legs as adults. They are not albino- notice the black bill and eyes. Leucistic swans seem more likely to occur in the Rocky Mountain Population. 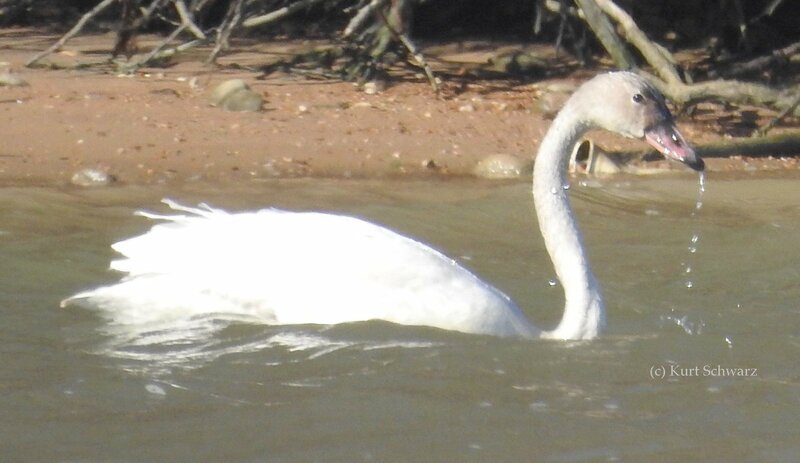 There are also some leucistic swans in Ontario which obtained eggs from Alberta (Rocky Mountain Population) early in its restoration efforts. 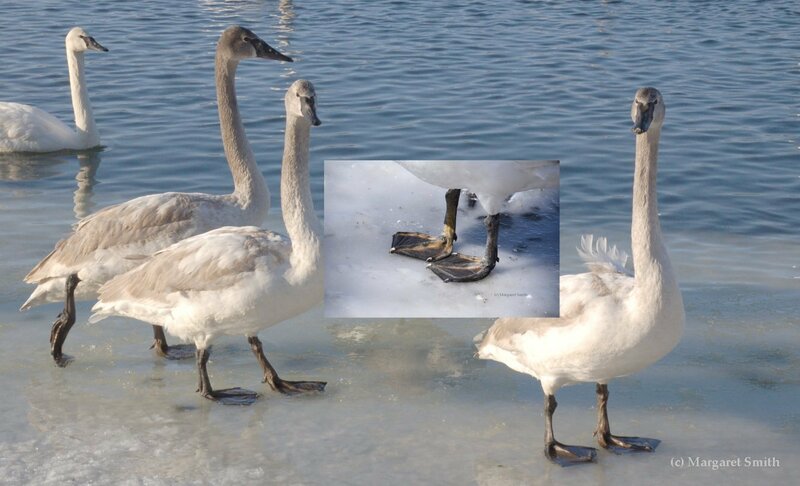 Trumpeter subadults, likely 2-3 years old, as evidenced by mottled leg color on the dark-legged swan. The yellow legs indicate the rare leucistic color phase. Leucistic Trumpeters are born white, do not go through the gray juvenile plumage phase, and often have very bright yellow legs as adults. They are not albino- notice the black bill and eyes. 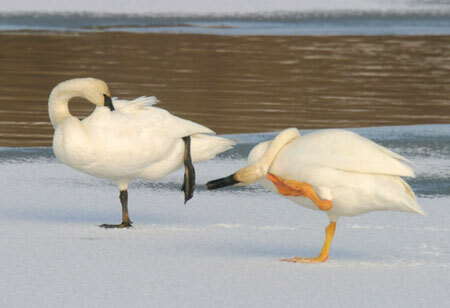 Leucistic swans are well known in the Greater Yellowstone Area. 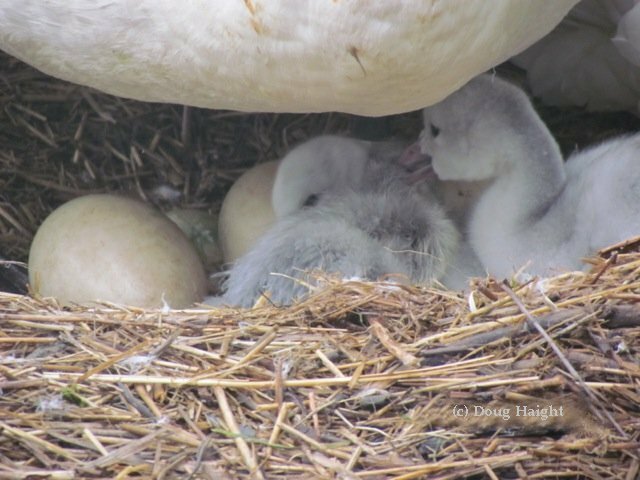 Here is a brood of Trumpeter Swan cygnets on Red Rock Lakes National Wildlife Refuge. Two are white (leucistic) and three are gray. Both parents are non-leucistic. 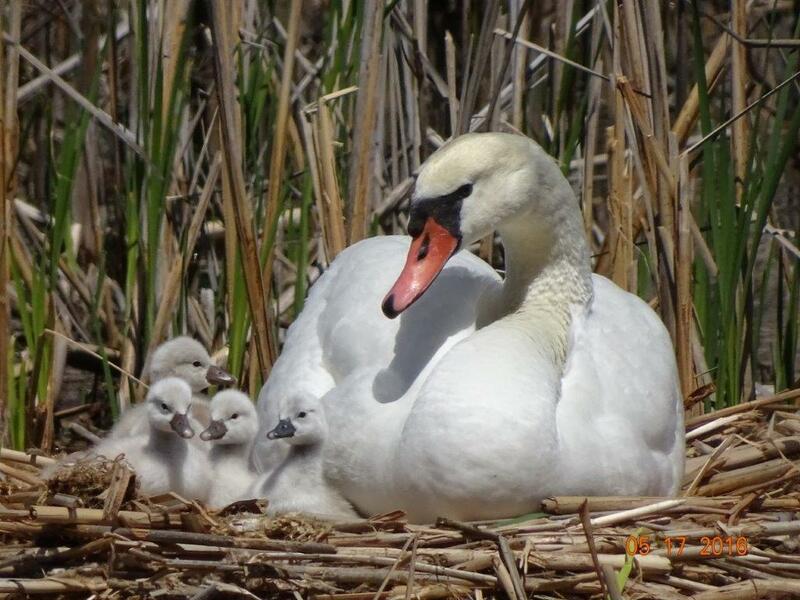 This photo of a swan family with one leucistic cygnet was taken at MacJohnson Conservation Area in Ontario. Leucistic swans are not albino. They have black bills and black eyes. Their legs and feet are orange/yellow. 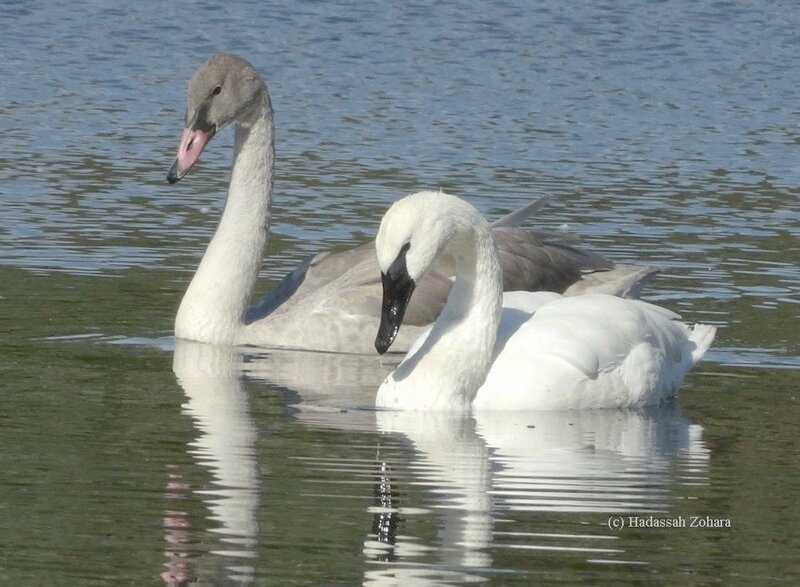 It can be difficult to tell the difference between a juvenile swan, known as a cygnet (pronounced "sig-net"), of Trumpeter and Tundra Swans. Both Trumpeter and Tundra juveniles are gray in their first fall and winter. 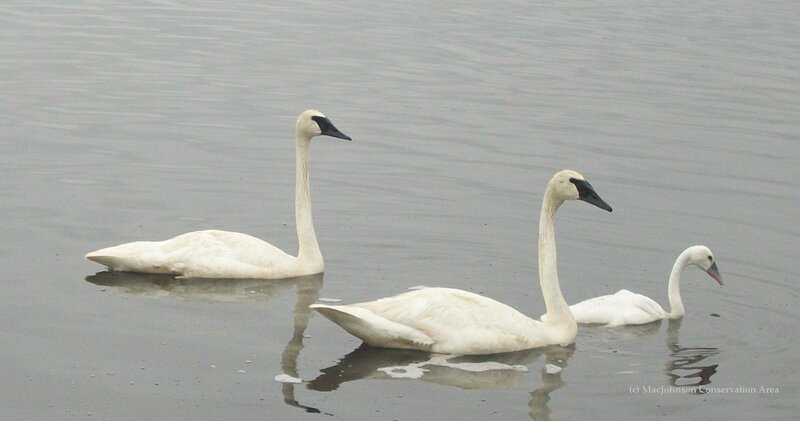 However, Tundra Swan cygnets generally turn white by March of their first winter, while Trumpeter cygnets do not turn white until the summer of their second year. Trumpeter juveniles are darker sooty gray, especially in the head and neck area. Their leg and foot color varies from pink to yellowish to dusky brown through their first year. 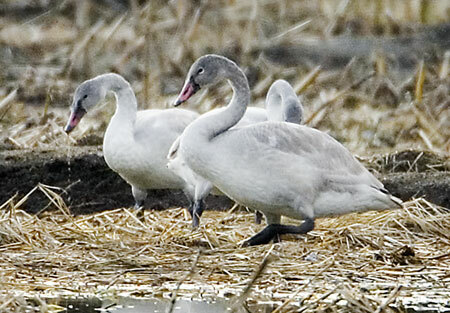 Trumpeter juveniles usually remain darker gray longer than Tundra Swans. Trumpeter juveniles have gray feathers on the head and neck persisting well into spring. 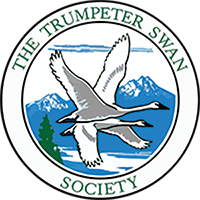 Wintering Trumpeter juveniles may vary in age by up to 6 weeks due to geographic differences in hatching dates. As a result, they show considerable individual and geographic variation in the timing of their molt into white plumage during their second summer. Tundra juveniles are brighter silvery gray with black legs and feet. Their feathers begin turning white in late December. By mid-March they are nearly all white. Trumpeter bills are black at base and tip with a pink middle early on, turning black over their first year. Tundra bill color is usually mottled pink with black tip, with less black at the base than Trumpeters. 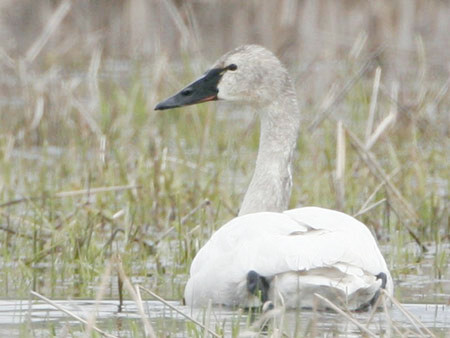 Juvenile bill color in winter gradually shifts to all black in both Trumpeter and Tundra Swan species. Mute swan cygnets have black bills, shifting to orange and black at maturity. 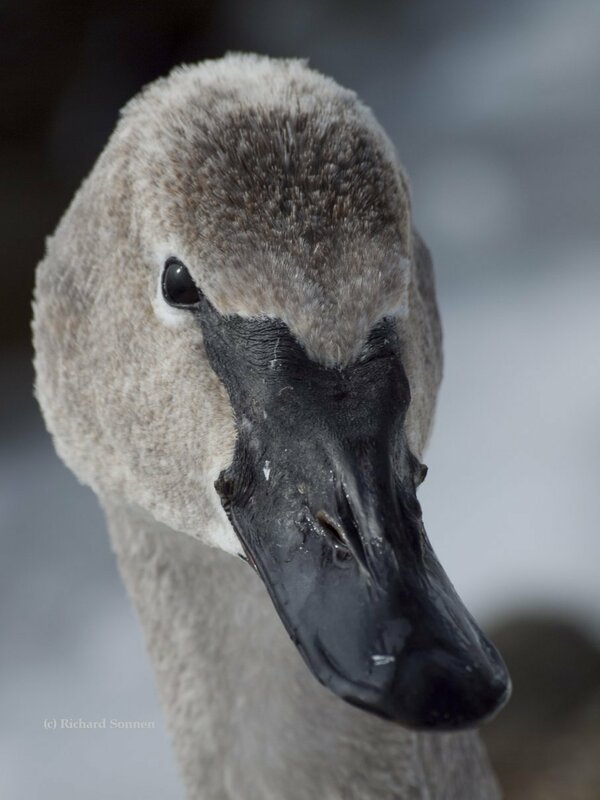 Someone described the difference between Trumpeter and Mute Swan cygnet bill coloration as "Nature's little joke." Trumpeter Swan cygnets have mostly pink bills, turning to black. Mute swan cygnets have black bills, turning to orange and black. Newly hatched Trumpeter Swan cygnets with more to go! 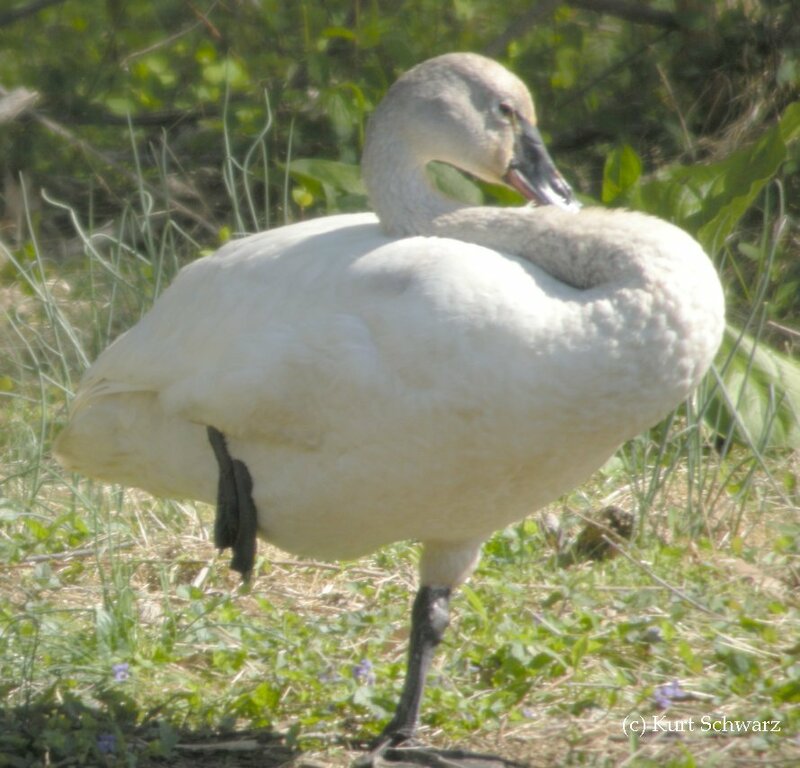 The Trumpeter Swan female (pen) continues to carefully incubate her eggs while newly hatched cygnets remain under her for warmth. Once all the cygnets are hatched, they will travel together with the pen into the water within 24 hours of hatching. 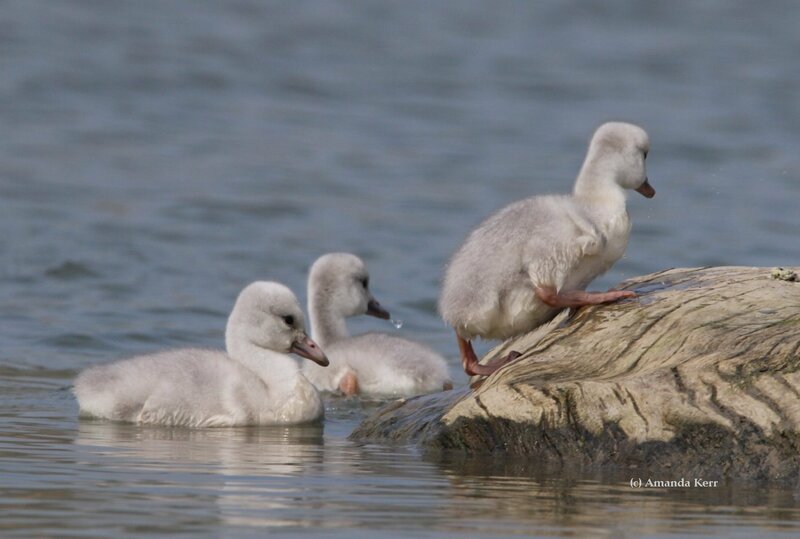 Newly hatched cygnets have pinkish legs and feet that will gradually darken over the summer. Trumpeter Swan cygnets eat mostly invertebrates and accessible aquatic plants during their first months. Cygnets rely on the valuable protein of invertebrates and insects during their first few months. They also eat duckweed and easily accessible aquatic plants, either stirred up by their parents or near the water's surface. Trumpeter Swan cygnets grow rapidly during their first summer. 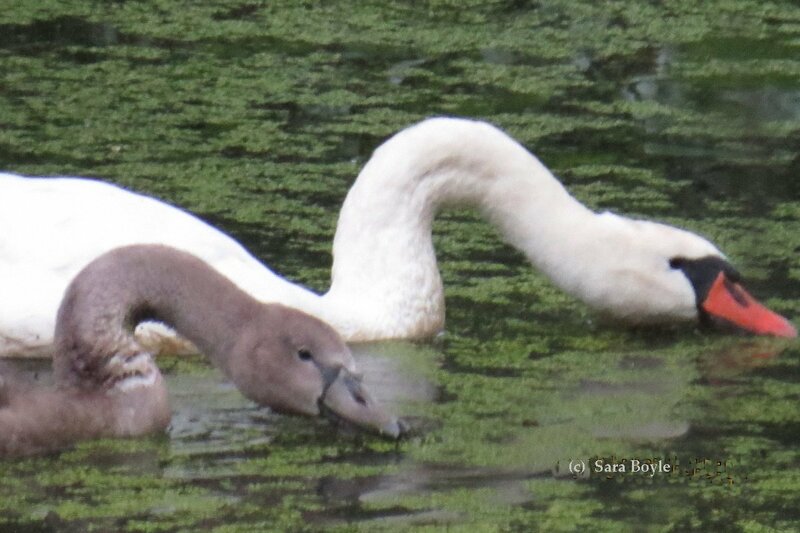 Parents stir up food from the water's sediment with their large feet to make feeding easier for the cygnets. The cygnets are vulnerable to predators such as snapping turtles, eagles, coyotes and other animals. It is not uncommon for only about half of the brood to survive to "fledge" (learning to fly) at about 12 weeks. By September/October, when cygnets learn to fly, they are nearly as large as the adults. They now feed mostly on aquatic vegetation, as their necks can reach to the water's sediment level for tubers, roots and other vegetation. Cygnets now have grey feathers, and their bills will gradually become black over their first winter. Trumpeter Swan cygnet feet and legs vary in color during their first winter. Many are dusky brown to black, while other cygnets have more yellow in their feet and legs. 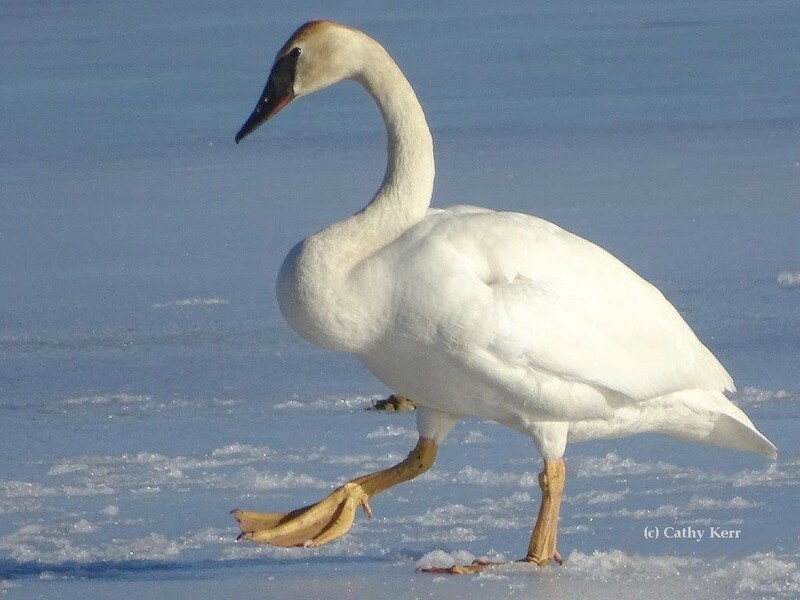 Trumpeter Swan cygnets are easily spotted on wintering grounds with their grayish/brownish feathers. They remain with their family group and will arrive and depart on the wintering areas together as a family. Generally the family returns to the nesting grounds in early to mid-March, weather depending. The swan parents will 'kick out" the cygnets upon their return as they will want to start another brood. Cygnets will turn completely white during their second summer. Often yearling siblings remain together and explore the landscape. 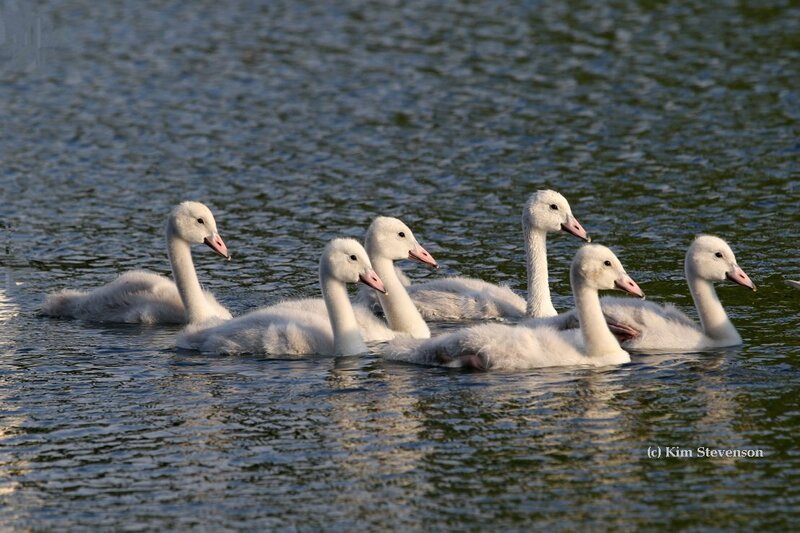 Swans will reach breeding age usually between age 3-6. They will generally return each year to the wintering areas the parents took them to, with their own families. Tundra Swan cygnets at hatch on the tundra. Above: Tundra Swans in early December, plumage all light gray, legs black. Above: Tundra Swan in mid January, nearly all white body, yellow showing on lore, black legs. Above: Toward the end of their first winter Tundra Swan feathers turn white following earlier pale gray plumage; pink bill with black base and pink tip. 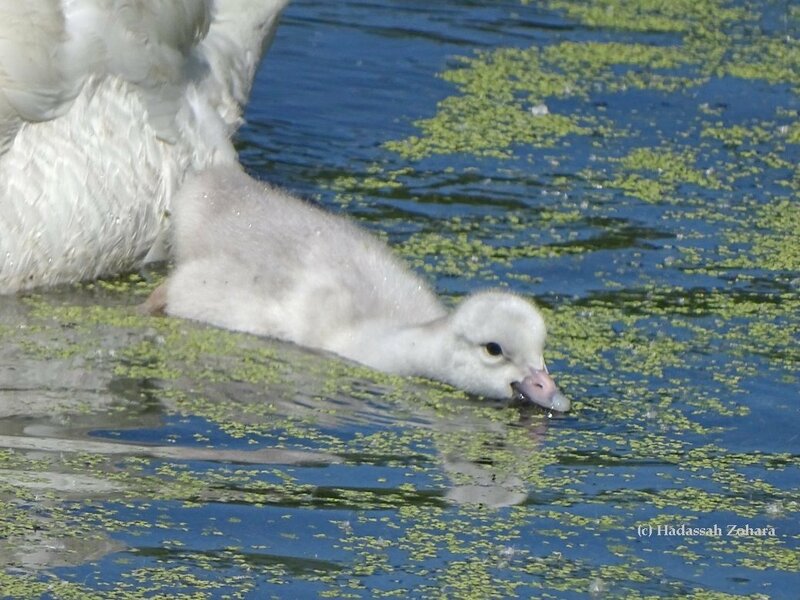 Even at this stage, you can see the patterning on the cygnet's bill that will eventually turn orange and black. 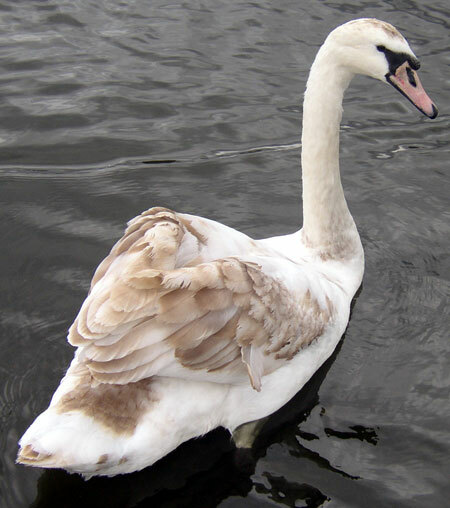 Above: Mute Swan juvenile plumage is white with brownish splotches; bill grayish orange with black base. Legs and feet are black.